This past Sunday Nana Smith came in for a visit. Although Mom and Dad would like to think it was to see them, we all know that it was really to see Mara. Nana came bearing gifts, and had a rather large one wrapped up in some plastic bags. After uncovering it, Mara looked at it a little funny. The stuffed horse she had brought was bigger than she was! Mara thought it was real we think, and was a little intimidated at first. She acted the same way she does around dogs that she meets walking the neighborhood. Very excited from afar, but more hesitant up close. She warmed up to him though after a little while. 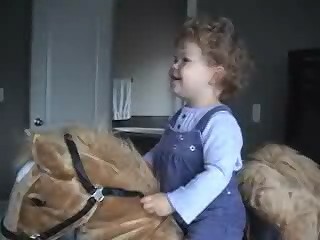 We captured some footage of her riding her trusty steed later on in the day after she woke up from her afternoon nap.